Hands on approach designed around specific needs. Depth of pressure is guaged by the individual's comfort level. Techniques incorporated to address specific needs as requested by the client. Techniques may vary from deeper work, clinical progression, trigger point therapy, body mobilization, stretching, myofascial release, among many more; all of which provide rehabilitative relief and/or physical maintenance for the avid sports enthusiast. Various pure essential oils are incorporated into the massage session. Choice of oil is determined by the desired outcome, whether for invigoration, pain relief, calming, etc. Heated Bamboo tools incorporated into massage providing muscle tension relief and increased circulation. This non-evasive ear canal clensing starts by inserting a hollow beeswax candle into the ear canal. The opposite end is lit, creating a vacuum which gently draws out debris from the ear resulting in relief of ear and sinus pressure. While some heated stones are placed on and under various points of the body, others are used in performing the massage strokes, providing a deep-heat penetrating, relaxing massage. Light, rhythmic touch stimulates the immune system by enhancing removal of toxins from body tissues in an effort to overcome and resist illness. Post Massage, application of Kinesiology Tape to improve function, correct postural imbalances, reduce pain and prevent injury. Massage movements influenced by negative pressure created by the placement of suction cup devices. Vacuum creates increased blood flow and muscle relaxation. Mild stretching and pressure used to relieve fascial restrictions all over the body promoting greater flexibility and range of motion. Massage suited to the needs of the expectant mother and her baby. A series of pure essential oils which are anti-fungal, anti-viral and antibacterial are dropped along the spine, massaged into the back and tops of the feet, concluding with applied heat packs. Provides anti-inflammation, immune building, oxygenation and detoxification. Pressure applied to the reflex points of the feet that correspond to other parts of the body which promotes healing. Thai Massage, a form of Vajrayanna Yoga, incorporates elements of mindfulness, gentle rocking, deep stretches and rhythmic compression focused on energy balancing of mind, body and spirit, while facilitating pain relief and stress reduction. No or minimal hands on approach, affecting physical, mental & emotional aspects of the individual. Aligning of the Chakras to improve health & well-being, physically, mentally and emotionally with the use of a pendulum, specific stones & essential oils. Gentle hands-on technique to detect and correct sensory, motor, or neurological imbalances in the cranialsacral system. Positively impacts the energy systems connecting the body, mind, and emotions. An ancient Asian bodywork addressing the body's energy flow with subtle touch to restore balance, harmony and well-being. Treatments designed to address the skin surface. 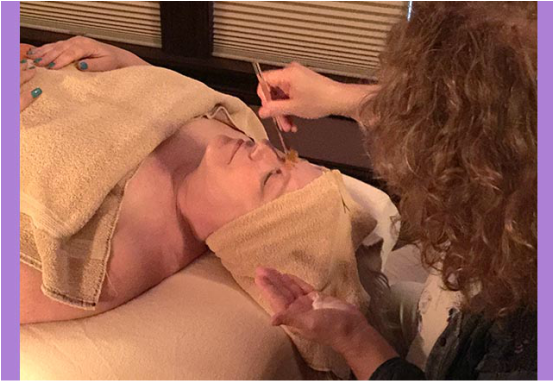 Facial cleansing with purposeful stimulation massage to improve circulation, eliminate excessive fluid through improved lymph drainage, restore muscle tone and elasticity by releasing muscle tension. An exfoliation and refinement of the skin using the effects of glycolic acid in sugar to generate a healthy glow. Detoxifies and exfoliates the skin with organic sea salts, generating a healthy glow. Combination of modalities created and designed by TLC Massage, Ltd.
Massage Cupping to Back & Abdomen; Leg Exfoliation, Warm Whole Body Wrap; All Embraced in Aromatherapy. Embraced in Aromatherapy, Hot Stone Massage & Exfoliation Focused to the Back. Bellanina or Aldila Facial Massage; Foot Bath; Hand Massage. Begins with Sea Salt Glow or Sugar Scrub; Ends with Bellanina Facial Massage. Full Body Relaxation Massage for Two Individuals in the Same Room. Full Body Integrative Massage Combining some or all of the following: Mud (Bentonite Clay), Hot Stones, Bamboo-Fusion & Body Scrub. Embraced in Aromatherapy, Foot Bath, Massage & Exfoliation of Feet (Scalp & Hand Massage During Foot Bath). Full Body Hot Stones Treatment; Massage Cupping to Back; Incorporates Soothing Hot Towels; Ending with our Special Spritz. Full Body Relaxation Massage; Massage Cupping to Back; Incorporates Soothing Hot Towels; Ending with our Special Spritz.